What with all those snow days in February, it's been hard to keep y'all updated with the happenings around the Triangle! There are several things coming up in the next few weeks of March that you won't want to miss. Come learn some basics of cooking gluten-free and dairy-free and enjoy some snacks and fellowship together. Please bring a large and small mixing bowl and spatula. RSVP to asncoc@gmail.com to let them know how many people will attend. What: Join us in the meeting room for coffee and casual conversation. The coffee gatherings are a great chance to meet parents, grandparents, and others who care about someone on the autism spectrum. We look forward to seeing new faces and old friends. The 2nd annual Dine 4 Autism fundraiser is coming up on April 21, 2015. 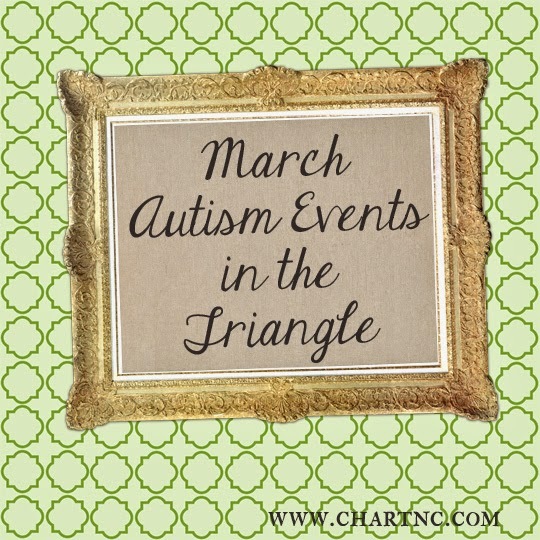 Hosted by the Triangle chapters of the Autism Society of North Carolina, it is a great way to raise money for ASNC and spread autism awareness at the same time. Get into the spirit this month by coming out to the Raleigh St. Patrick's Day Parade to see the Dine 4 Autism float! The parade is Saturday, March 14th at 10am in Raleigh. Click the link for more details about the parade route and parking. The Dynamic Community Charter School in Raleigh was started by autism mom and author Diane Gill Morris with this mission: "We believe that children with intellectual and developmental disabilities can continue to discover and maximize their potential through middle and high school and into adulthood, and we are determined to create an educational environment that expects that growth and facilitates it." To the distress of the families and students who have finally found a welcoming school home, DCCS has been under attack from the state Charter School Advisory Board, despite the strong support the community has for this special school. There are a number of fundraisers coming up this spring to support DCCS, and we hope that you will consider joining in on them. Here is the calendar of events; follow Dynamic Community Charter School on Facebook to keep up-to-date on all of the happenings. March 7th: Dynamic-Con - A one-of-a-kind, never before seen, comic-con inspired gala benefiting Dynamic Community Charter School. This evening will be a black tie optional, adult only event with cocktails, a gaming lounge, silent auction, and more. Check back soon for information on all of the many autism summer programs that will be going on in a few months!